Welcome to a new feature here on The Veg Life! In my recent poll, an overwhelming amount of you indicated that you were interested in seeing more than just food. Vegan beauty & product reviews topped that list. So each week (yes, week), I’ll be reviewing a different vegan beauty subscription boxes such as Vegan Cuts, Ipsy and Petit Vour. If you’re new to Petit Vour, it is a monthly subscription box that is filled with a variety of sample and full-sized products for you to try. What I love about this idea is that you get to experiment with products you may not have known about otherwise. Plus, if you are like me…you pretty much LIVE for mail and this is like Christmas every single month 🙂 This little box retails for just $15 per month (free shipping in the US, $23 per box in Canada). Perfect for gift-giving! So let’s get into the unboxing, shall we? LILY LOLO Sculpt Sculpt & Glow Contour Duo – This product, in my opinion, makes this entire box worth it! Sculpt with the bronzer and glow with the highlighter. It’s a decent size which will last you quite a while. Loving this one! FORMULARY 55 Body Polish – Sea Minerals with Rosemary & Grapefruit – This little bag is to be mixed with water to create a paste that scrubs your skin. They also suggest for an extra moisturizing boost,to mix the body polish scrub with a bit or coconut or olive oil instead of water. This sounds really interesting to me and I will definitely be giving it a try! TRUE MORINGA Lavender Facial Oil – This facial oil combines anti-aging and moisturizing properties of cold-pressed Moringa oil with the soothing lavender. Formulated to reduce redness, damage, dry skin and signs of aging with daily use. Add a few drops to fingertips and press the serum onto cheeks, forehead and chin. Smooth over nose and lips. Then, massage into the skin using light, upward strokes to lock in moisture. BOX NATURALS Luxe Towelettes – These are great for removing makeup, cleaning hands, wiping down your yoga mat, soothing skin irritation. They are 100% bio-degradable, paraben-free, petrochemical-free, sulfate-free, artificial detergent-free, fragrance-free (which I VERY much appreciate) and PH balanced to accomodate the sensitive needs of your body. 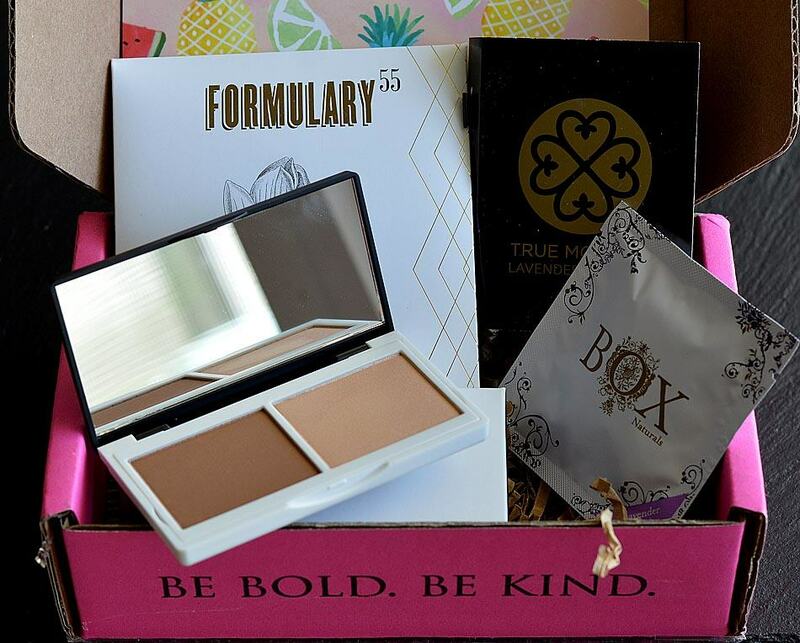 As an added bonus, a portion of BOX NATURALS profits benefits women’s issues all over the world. If you see something you like, you can shop the full-sized version of every product in this box at PetitVour.com PLUS, earn 20% back with every single purchase. You can also check out the monthly subscription service here. I’m looking forward to my August box and will share it with you when it arrives. You can expect a new review from me every single Sunday!